In order to customise the user experience within Kiosk Browser, you can ensure that only the relevant buttons are displayed on the toolbar. All buttons can be added and removed within the Settings > Toolbar menu as below. When enabled, this button will load the home page. The refresh button will refresh the current URL. This will open the bookmarks bar and display any bookmarks you have stored. 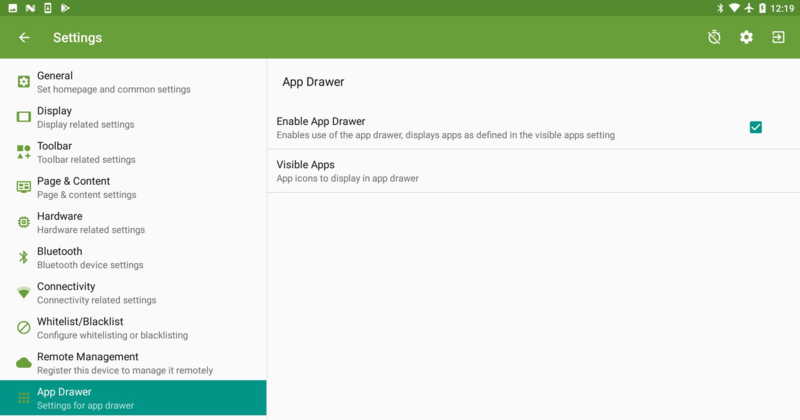 Opens the app drawer and displays any apps that you have enabled. Any applications you would like to be displayed in the app drawer, must be enabled under Settings > App Drawer > Visible Apps and the Enable App Drawer option switched on. The Home, Refresh, Back and Forward buttons can be removed from the toolbar as a group, using the Browser Controls option. Opens the default camera within Kiosk Browser. Opens the barcode scanner within Kiosk Browser. Opens the Google Cloud Print menu. This will include the Restart App option within the overflow menu. The overflow menu is enabled by default. By hiding the overflow menu you will need to access settings and exit to launcher by using the multi-tap method.